Willow Gardens resident Vera Nicholson has celebrated her 100th birthday in style with family and a visit from the Yateley Town Mayor. Vera enjoyed spectacular celebrations at Anchor’s Willow Garden care home on Tuesday 15 January. 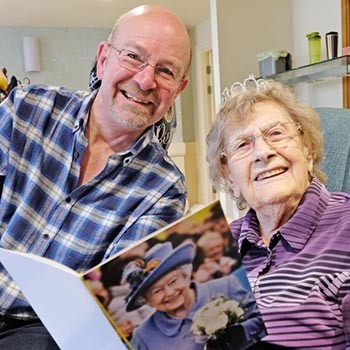 The centenarian, who has been residing at the home since 2017, had previously spent nearly eight years living in Crowthorne. Her son, Mike Nicholson, said: “She has been waiting 100 years for this day and it’s a very proud moment for me and the family. “This morning we have been on Facetime to family who live in Australia, which she really enjoyed. As well as receiving a letter from The Queen, the Yateley Town Mayor joined residents in making the day special. Mayor Tony Spencer said: “It’s a real pleasure to come along and celebrate Vera’s 100th birthday. Vera is the first resident in the home to reach the milestone age and is well-loved and respected by everyone. Vera was joined by the rest of the residents in the dinning room and later enjoyed a meal with her family, including grandchildren. Happy Birthday Vera from everyone at Anchor!